Minneapolis, MN is truly a boater’s paradise. From the majestic Mississippi to the Chain of Lakes, avid and occasional boaters will enjoy playing on Minneapolis, MN waters. Regardless of where you do your boating, it is important to keep your propellers and the mount in good working order. Whether using stainless steel propellers or aluminum propellers, sometimes problems occur. When they do, contact the skilled boat mechanics at Anchor Marine Repair. When it comes to boat propellers, you have two choices, stainless steel propellers or aluminum propellers. Both have advantages and disadvantages and unlike some boat features, it all boils down to preference and boat style. Aluminum propellers usually cost less, have protective coatings, are lightweight and provide reliable performance. When it comes to repairs, aluminum propellers are also less expensive to get back into good working order. Stainless steel propellers offer higher performance because the blades won’t flex or bend under pressure like aluminum propellers. Stainless steel propellers have blades that stay in peak condition longer than the aluminum type. Stainless is often more durable when it comes to contact with sand and impacts. With either type, should you have problems, you want to make sure you choose a company like Anchor Marine repair, which offers quality propeller repairs. Make yourself aware of some of the common prop problems. This may help you to understand when you are having problems and need to contact a propeller repair company in MN. Ventilation: When exhaust gas or air is pulled down into the blades, this will cause the boat to lose speed and will lead to slippage. Slippage is basically the difference from the hypothetical pitch to the real pitch. The goal is to have minimum slippage for premium performance. Cavitation: This propeller problem happens when there is a range of low pressure produced by the inability to travel through the water. The water surrounding the boat propeller starts to bubble. Cavitation and pressure changes can end in erosion on the surface of the boat prop blades. Silt and sand contact: Even with minimal contact, soft surfaces can harm propellers. Be careful! Get quality propeller repairs with the skilled boat mechanics of Anchor Marine Repair. 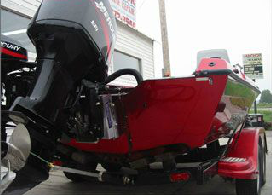 Call us at 763-972-3540 or visit our shop at 667 Babcock Boulevard Delano, MN 55328.